Dairy free lunch at work ? guarantee a dairy free meal. If you have a restaurant or canteen on site, they may already offer dairy free options or be happy to do so – have a chat with the catering manager. You may even inspire them to try something new! Chicken or meat salad sandwiches made deliciously moist with dairy free mayonnaise or dressings. 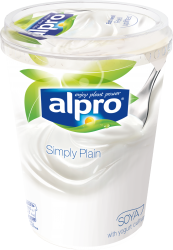 As a dessert, pick one of Alpro’s new creamy and fruit soya yogurt alternatives or choose from chocolate, vanilla or caramel Alpro soya desserts.